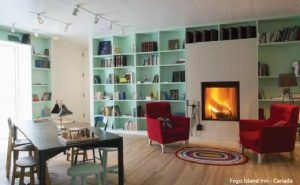 Now, let's get inspired by the accomodation! 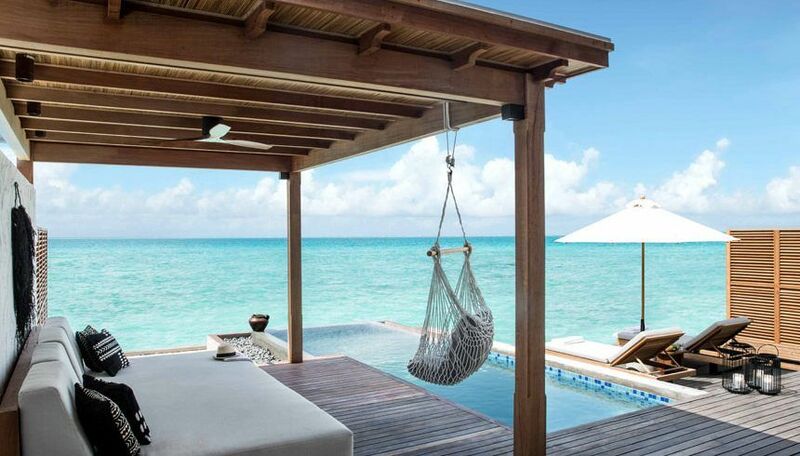 Have you already chosen your summer destination? 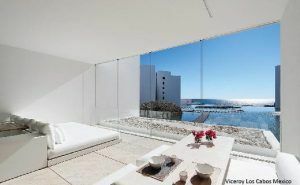 Here, a first selection of the 12 best architecture-design hotels in the world. From the interior to the exterior design, from the ideas to the surfaces. More details soon! 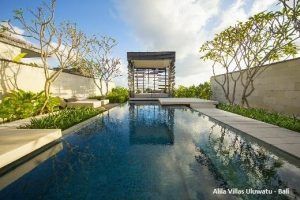 Alila Villas Uluwatu is not only an eco-friendly and contemporary design hotel, but also a gallery of pieces of art by the most famous Indonesian artists.​ Literally “hanging” on the Indian Ocean, with its “cages” in antiqued wood and ceramic exteriors, this hotel turns its sophisticated minimal style into its architectural strengh. 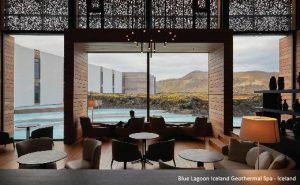 The Blue Lagoon Iceland portrays the perfect harmony of opposites in all its elements. Its linear and clean design complies to the unspoilt nature of Iceland. 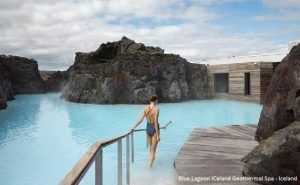 From the heat of the thermal pools to the icy Icelandic air, from the perfect geometries of the beton to the rough rock, from the impeccable choice of technical woods for rigid exteriors to the spontaneity of the wild moss and the snow. 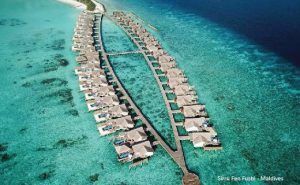 Are you ready to spend a warm August holiday on the ice island? 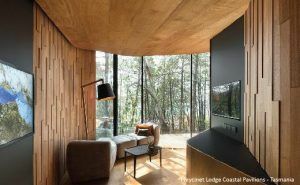 Located in Tasmania on the eastern coast and within the boundaries of a national park, Freycinet Lodge Coastal Pavilions, is a marvelous combination of smooth lines, sinuous walls, soft lights and intimate interiors. From the smart ceramic decor up to the walls glow reflecting surrounding nature. 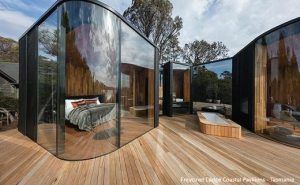 A rare eco-design that we could only describe as….sensual! 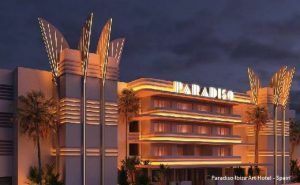 “I dream about an hotel facade with more than 70 typical houses”. 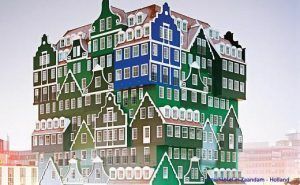 That’s not crazy, but it’s an idea from the architect who design and create the unique Inntel Hotel of Zaandam in Netherlands. The exterior design evokes the local tradition, just like the interior ones, marked by the huge and amazing pictures printed on Crystal Exe. 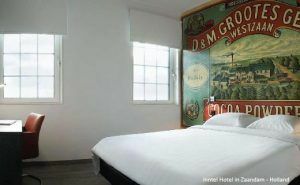 In this amazing hotel, you’ll reliving the good old days, thanks to the use of up-to-date materials. 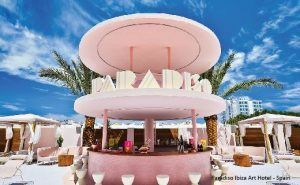 In the purest 70’s style, the Paradiso Art Hotel Ibiza is a real tribute to pop art and…pink! 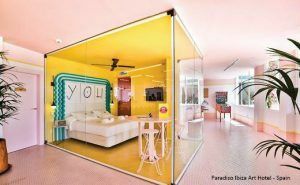 From furnishings as Smeg refrigerators and speakers Marshall, to the hallways that become real temporary art galleries of urban art and avant-garde. 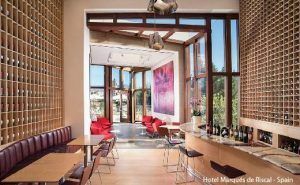 Thanks to the use of innovatives materials as acrilyc plates, solid surfaces and Re-wood, the design of this hotel is surprisingly… retrò! 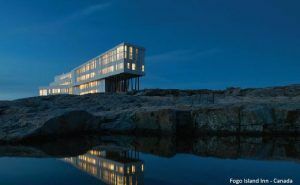 The Fogo Island Inn is build on the edge of the world, on the canadian coasts of the Atlantic Ocean. 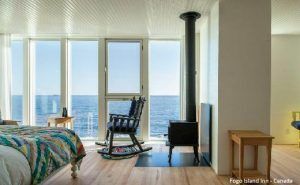 An isolated place where you can find yourself, observing the season changes throught large windows of expertly furnished rooms, with familiar and colorful furnishing accessories. 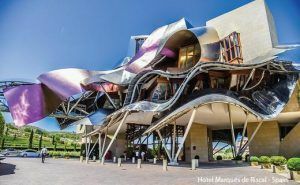 The Marques De Riscal hotel can be represented by a name: Frank Owen Gehry. 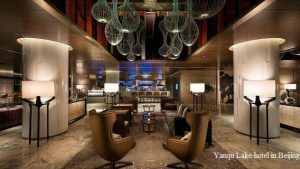 His unmistakable refinement caracterize the entire style of this real work of art intended to hospitality. 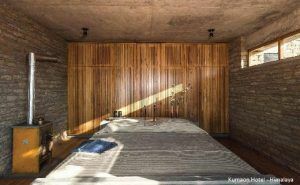 Elegant and luxurious materials, such as slate lab or cherry veneer, are applied to deconstructivism typical of the well-know international architect. 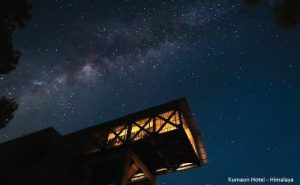 You must visit this prestigious architecture, even if you’re not a guest! 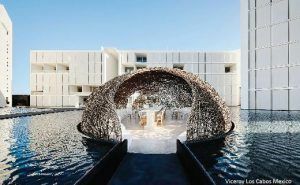 Designed by the famous Mexican architect Miguel Angel Aragonés, the luxurious Viceroy Los Cabos Hotel is a stark and minimalistic structure that is reflected in his electric-white 194 rooms, suites and villas. 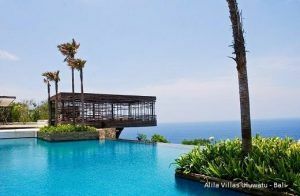 What makes this place even more spectacular is the “Nido”, a latticed timber structure, designed by Spencer Mar Guilburt, that appears to float on the water. 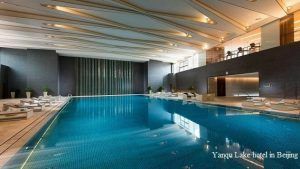 The clean and refined design and the choice of elegant materials, such as glass for exeriors and dark wood for interiors, totally reflected the philosophy of Zhang Hai Ao, the chinese architect of the luxurious Yanqi Lake Kempinski Hotel in Beijing. 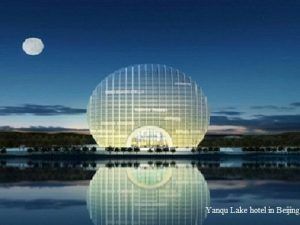 A philosophy coherent with the choice of architectural elements with a strongly symbolic nature, typical of oriental world: the rising sun as economic growth, an entry that recalls both a fish’s mouth – as symbol of prosperity- and a scallop, symbol of luck. 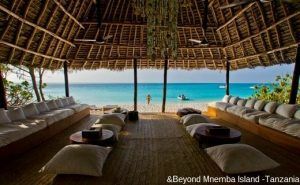 Considered as the pinnacle of Tanzania holidays, the &Beyond Mnemba Island is one of the glamorous and luxurious coastal retreats in southern Africa. 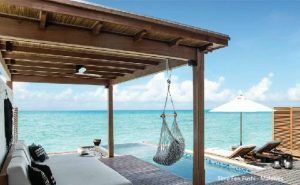 Accomodation is in just 10 roomy, tatched beach bandas with sea views, offering elegant interiors, created with wood, rattan, reed and rough glass and furnishing is confortable, cool and contemporary Keep it in mind if you’re looking for african holidays! 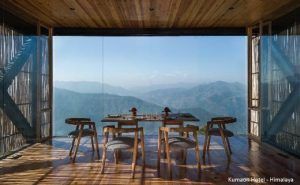 After going through step paths in a 1600 meter hight bambù forest in the Himalayas, you will arrive at the luxurious Kumaon Hotel. 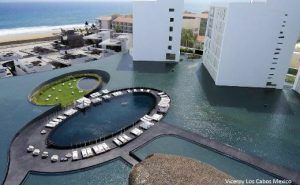 Designed by the Zowa Architects design studio, this hotel is composed of 10 luxury suites, a library, a solarium and a restaurant. 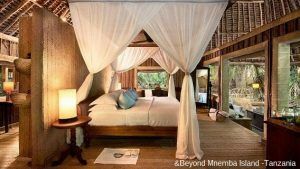 Pine wood, bambu, stones and fabrics worked by local artisans: every material used for the interior and exterior design comes strictly from the local indian lands.